Buck Brush is a fragrant shrub whose flowers vary from blue to white in the spring. This shrub can be seen from Oregon to Baja on the coast and in the Sierra Nevada mountains. Because of its wide geographical range it is difficult to precisely specify colors, form and size. 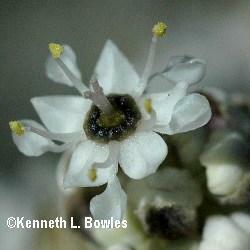 Most commonly the flowers are white, although blue flowers may be found closer to teh coast. This plant is very drought tolerant, it has a beautiful fragrance when in blossom, and is also a secondary pioneer plant after fires. it is primarily used in restoration but is beginning to be recognized by gardeners for its durable nature and may be a good choice for difficult sites.